The plugin captures customers name, and email address as soon as they’re entered during checkout. These are stored, alongside the user’s shopping cart contents just in case they don’t complete their order. If an order is received – great. If not, your recovery campaign will spring into action. Our Pro add-on goes even further, allowing you to capture email addresses, and carts as soon as people add items to their cart. Email campaigns are triggered automatically when carts are detected as abandoned. Every email can include details of the shopping cart contents – making it easy for customers to click right back into checkout and have their cart filled straight up with the relevant products. You’re fully in control of your email campaign. The plugin comes with responsive HTML emails, and default content – all editable within the plugin settings. Tags are included letting you drop in the cart details, links back to checkout, and unsubscribe links. If you want the emails to fit even closer with your store’s branding you can even override the default templates with your own HTML email template. 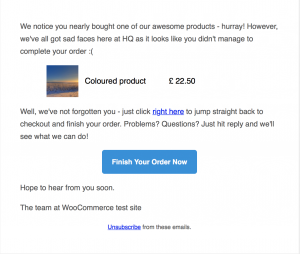 Want to send a sequence of emails, then Cart recovery for WordPress Pro has you covered. With it, you can set up multiple emails, each with specific timing to maximise the chances of converting your abandoned carts. You can track in-progress carts, abandoned carts, and recovered carts easily within WordPress. The plugin provides you with simple stats on where customers are in the process, their details, and cart contents, and historic performance of your campaigns. The Pro upgrade even lets you view the details of all of your carts, including exporting them for use elsewhere. Want to offer your customers discounts, but worried about generic codes being shared around? Our Pro add-on lets you generate unique discount codes for each email that goes out. All integrated fully with your WooCommerce, Easy Digital Downloads, WP e-Commerce, or Restrict Content Pro system. Our free plugin – Cart recovery for WordPress – works with WP e-Commerce, WooCommerce, Easy Digital downloads and Restrict Content Pro seamlessly out-of-the box. No need for separate versions, or complicated setup. The plugin will automatically detect the eCommerce system you’re using and connect up automatically.